the late DR. JOSÉ ARGÙELLES - The Mayan Factor: Path Beyond Technology. All Mayan dates on this website are from the exact accurate Guatemala-highlands Mayan calendar "count of days." the symbol names and the four-color order use (yellow > red > white > blue), which are all easy to learn HERE. 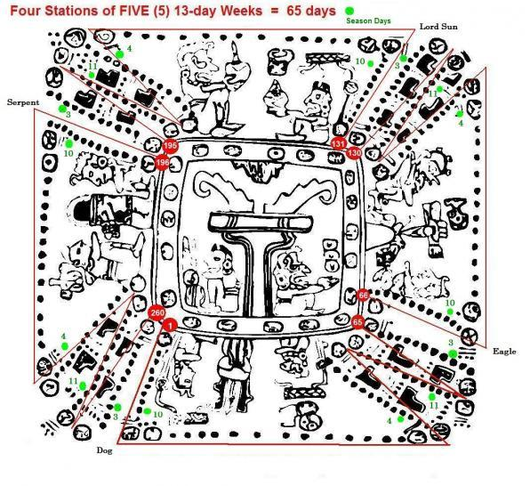 but Richard realized, and all scholars agree, the calendar of the Yucatan-lowlands Maya is miscounted by 57 days, as of 2019.
is no longer aligned with the rising and setting cycles of the planet Venus. For PROOF see today's date at the Smithsonian National Museum Of The American Indian website - click HERE. Time to switch-over to using the Guatemala-highlands calendar, so get used to it. It was hard to make the switch at first, but Richard did in 1997. This website contains the most recent material gathered from talks, classes, lectures and books of Richard Alan Eagle. and to the Lunar and Solar Eclipse cycles of the Sun and Moon. so after August expect to see big "turns of events" before Christmas, preceeded by a "preview" in June 2019. Be Loving now for all one has is today, give it away, love. Please support this website with your donation. Thank you. 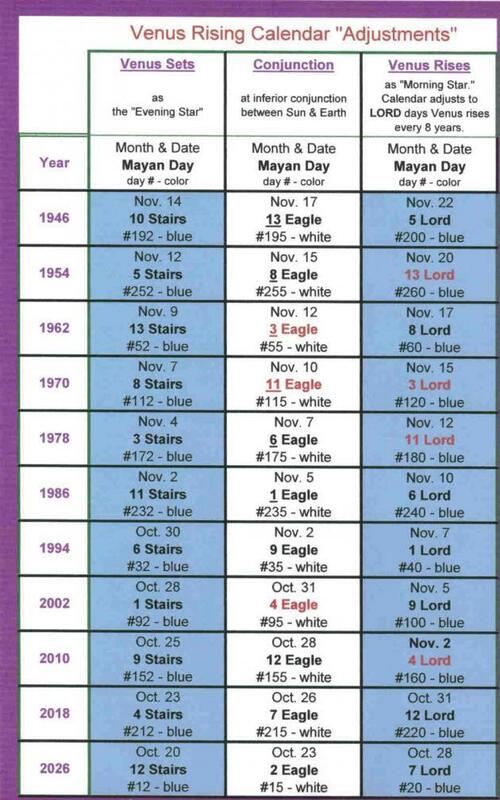 A small red symbol ^ highlights the mid-point of Weekday 7 in every 13-day mayan Week. The new column: MOON, to the right of the January-December Gregorian calendar date column on the left-side. For the Moon at the Perigee point: the Moon's orbit is at its closest point to Earth; the Moon appears larger; creates more stress. For the Moon at the Apogee point: the Moon's orbit is at its farthest away point from Earth; the Moon appears smaller; creates less stress. Around the Perigee point: plants branch-up to leaf-out; the combined magnetic-and-gravitational-forces of the earth-moon-sun as they move-closer-together increases-pressure forcing-expansion. For example: when squeezing the middle-of-a-balloon, the balloon expands opposite-the-squeeze-point; or when two-bar-magnets with the-same-positive-sides-or-negative-sides-facing-each-other are forced-together it creates a strong-RESISTANCE-and-ENERGY-rebalancing, which precipitates the-stronger-force-fields energy-and-stress the closer-the-magnets-are. Around the Apogee point: plants withdraw-their-energy inward to the roots; the combined magnetic-and-gravitational-forces of the earth-moon-sun subside, move apart, and decrease the pressure-and-stress. For the Moon at ascending North node point: the Moon's orbit transits the equator of Earth, from the South to the North. For the Moon at descending South node point: the Moon orbit transits the equator of Earth, from the North to the South. For gardening applications, according to proven and ancient bio-dynamic gardening practices, the times of these four-Moon-positions signify a void and suggest a ceasation of all gardening activity. ~12-hours plus or minus either side of the exact time of Perigee and Apogee. ~6-hours plus or minus either side of the exact time of South node and North node transits. In all, Love, one's intention. For all karmically struggle, feel and yearn for Life, being whatever form One creates now. The caring together for All the Good things of this planet. For uniting the mind of Reason with the Heart and holy Spirit of Love, wisdom. >< Mid-point on the calendar: Days #130 - #131. For All-are-Teachers dedicated to Being the example in sharing Life-giving powers. For the illusions of this world are One's own dualities surrendered-within. Ascend to The Stars, master, with the last step taken by g o d.
All is sacred Love, master perfect Peace. ONE WAVE of Time every 13-days is just-like the musical scale OCTAVE. 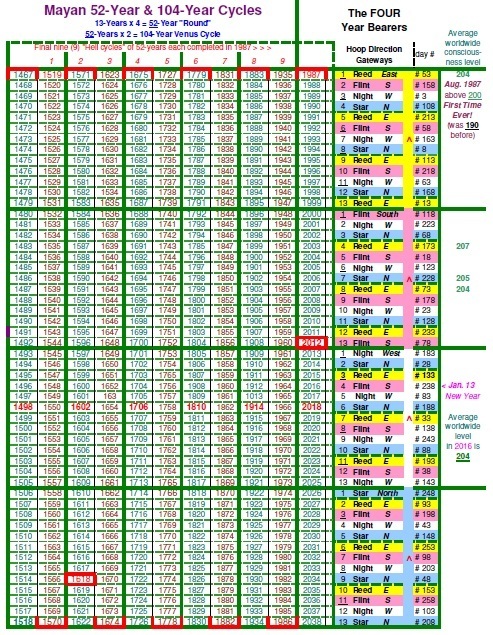 :VIEW-ALL 260-Days For a scroll-down Mayan calendar format of the entire current 260-days. 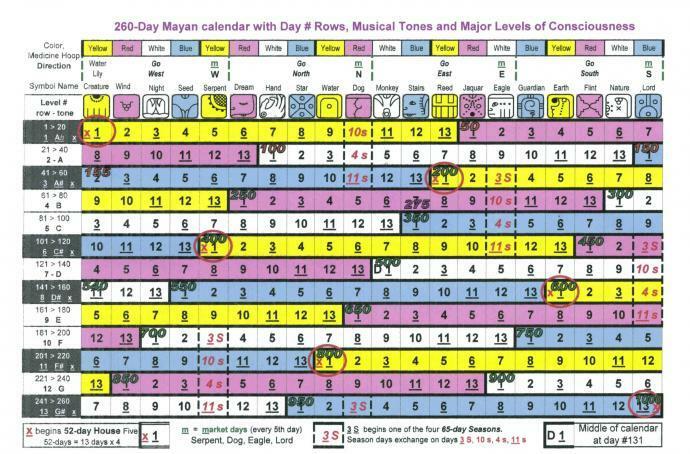 Calendar BASICS For knowledge: the Basics of How-to-Use a Mayan calendar. ADVANCED Basics For knowledge: modern science meets the ancient Mayan calendar: Go Beyond the Basics. Start HERE For a Mayan calendar overview using a modern clinically-proven tool used in levels-of-consciousness research. The Mayan calendar has Four Seasons of 65-days. constantly refining dense matters into light souls. Four, All Dance as One. and the right and- eft scenes both are time-of-access between both the Heavens and the Underworld. When I first saw this Mayan calendar codex puzzle, it reminded me of being a child playing a board game called Chutes & Ladders, where one moves the game piece forward or backward by rolls of a dice, sometimes unexpectedly upwards by ladders or downwards by chutes, all while racing to be first to the top. Many cultures around the world notice and record the rising and setting patterns of the brightest light in the evening and early morning skies the planet, named-in-English: "Venus." The Olmec and Maya cultures of Mexico and the Guatemala highlands in Central America, are the first to create a 260-day Venus-calendar, recognized today as the most accurate calendar in the world. In Maya lore, Venus, the bright light traveling the sky, is the "Two-Brothers": the Feathered Serpent and his Shadow Twin brother. The planet Venus rises in the East, in the early pre-dawn sky as the “Morning Star” or Feathered Serpent and is the third brightest- light in the sky after our Sun and Moon. Venus shines-bright in the early morning pre-dawn eastern skies as the Morning Star for 236-days or approximately 8-months. The Feathered Serpent days are days of of: peace, rebirth, rebuilding and common unity. After 236-days as the Feathered Serpent/Morning Star Venus disappears from the skies for 90-days, slowly spinning away, farther and farther from Earth, hidden away from view behind the Sun. After 90-days hidden behind the Sun, Venus is seen rising again after sunset in the West evening-sky. There in the western skies Venus shines as the “Evening Star” or Shadow Twin for 250-days. The Shadow Twin days are days of: ceremonial challenges and ceremonial conflict theater or real war and unexpected challenges. Venus as the Evening Star becomes brighter and brighter as it moves towards Earth, closer and closer on its nearest approach to Earth every 1.6-years. Then, just as Venus is at its brightest right after sunset, it disappears for 8-days. In Maya lore, the Shadow Twin has died. For 8-days Venus moves across the front face of the Sun, hidden by the glare of the Sun, and directly between the Sun and the Earth. It’s at these moments, every ~19 months, when our nearest neighbor planet-Venus passes close-by to Earth. After 8-days hidden, Venus reappears, reborn at dawn at the side of the Sun, at sunrise in the East dawn sky. In its new-phase as the Morning-Star, the Feathered-Serpent is the brightest-light before dawn for the next 236-days. The Morning Star/Feathered Serpent days of peace, rebirth, rebuilding and common unity return. The Tides of Time. When Venus is approaching Earth as the Evening Star: the combined magnetic & gravitational forces of the Earth and Venus, as they move closer together, increases pressure and stress. For example: when two bar magnets, with the same positive-sides or negative-sides facing each other, are forced together this creates a strong RESISTANCE & ENERGY re-balancing, which precipitates the stronger force-fields energy & stress the closer the magnets are. 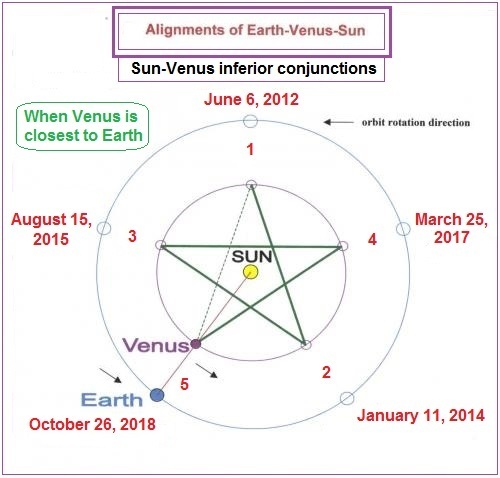 When Venus becomes the Morning Star: the combined magnetic & gravitational forces of the Earth and Venus: decrease, subside, move apart, and reduces overall pressure and stress. These rising and setting patterns of the planet Venus are repeated on-average every 584.92-days, that's about every ~19-months. These Venus 'fly-by' patterns repeat exactly five-times every 8-years, during five different months of the year. Let’s examine this 8-year pulse, this 8-year rhythm of Venus. It is a VERY important rhythm. Indeed, it is a hythm that connects to the musical scale, a truly sacred rhythm pattern that holds the key to understanding the musical encoding of time in our solar system. If we could super speed-up time and watch the orbits of the planets around our Sun from high above our solar system, we would see that over every 8-year-cycle of time Venus exactly aligns between the Sun and the Earth 5-times, creating a spiraling 5-pointed star pattern around the Sun. A five-pointed star pattern is exactly the same kind of pattern design detected within the double-helix spiral blueprints of genetic DNA, in the cells of all living creatures on Earth. The organs of the body are spaced a certain distance from the brain, and in the same way the 'organs' of our solar system, the Planets, are spaced a certain distance from the Sun. The key to the accuracy of the Maya calendar is that its based upon the exact rising and setting-dates of the planet-Venus, as was recorded within the ancient Maya-painted-paper sacred books; for Venus-creates a five-pointed-star-pattern-orbit around our Sun. Maya-astronomers recorded the exact Mayan dates Venus-appears-and-disappears in the sky over 8-year-cycles-of-time. Many pages of calculations for Venus are matched with the Mayan daysign Ajaw or Ahau (LORD or SUN) as documented in the Mayan records. 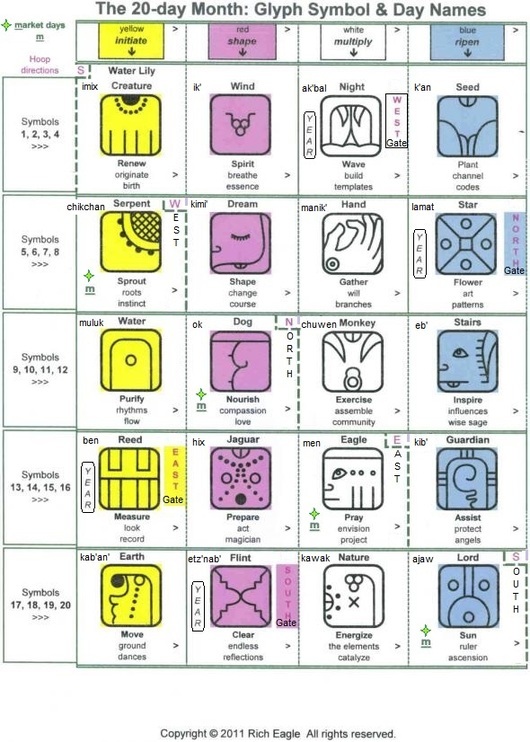 The Mayan daysign representing the planet Venus are drawn next to the Mayan calendar day: Ajaw or LORD. So, Mayan calendar accuracy Rule #1 is: Every 8-years the first sighting of Venus rising in the eastern dawn sky occurs on Mayan day: Ajaw LORD. Currently, Venus is in its new phase as the Morning Star, the Feathered Serpent, and is the brightest light before dawn for 236-days. The Morning Star/Feathered Serpent days of peace, rebirth, rebuilding and common unity have returned. the-late DR. JOSÉ ARGÙELLES - The Mayan Factor: Path Beyond Technology. This website contains the most recent material gathered from talks, classes, lectures and books of Richard. He created handout-charts combined with a 12-month January-December Gregorian calendar in 1989 for his first Mayan Calendar Guidebook edition, to help teach his first Mayan calendar workshop in Minneapolis, Minnesota. In 1991, he is visited in Minneapolis by Willard van de Bogart, a close friend of the-late DR. JOSÉ ARGÙELLES. Willard told Richard that José confided in him. Willard stated, "JOSÉ said to me, that, 'Of all the people he knew of, besides his wife Lloydine, that you have the best understanding of his Mayan calendar research'." Willard then presented to Richard the first pre-production DREAMSPEL kit, along with a hand-written note from JOSÉ , with the words, "Keep up the good work." 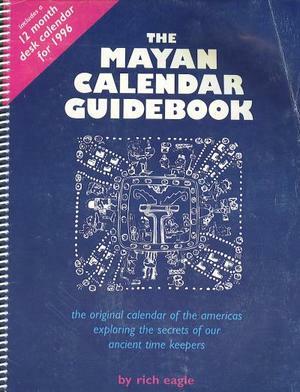 For the 1996 edition of The Mayan Calendar Guidebook 4,000+copies sold around the world and had media coverage by the TV-show Strange Universe on Canadian television. "This excellent book is a thorough teaching reference that is also easy to understand. The Mayan Calendar Guidebook presents the what, why, and how of tracking the energies and other information presented on the calendars…This reference book should become part of your regular inventory. Customers who are just learning to use a Mayan calendar will find it answers most of their questions and prepares them to be able to use any current Mayan calendar more effectively." In 1998 science genius and inventor Dr. Patrick Flanagan called the research, "A masterpiece." For the video of his class in Sedona, Arizona,on July 26, 2012, click here: Watch CLASS video,. The beginning of this song plays for one-minute and then the complet song plays at the end of the class video.